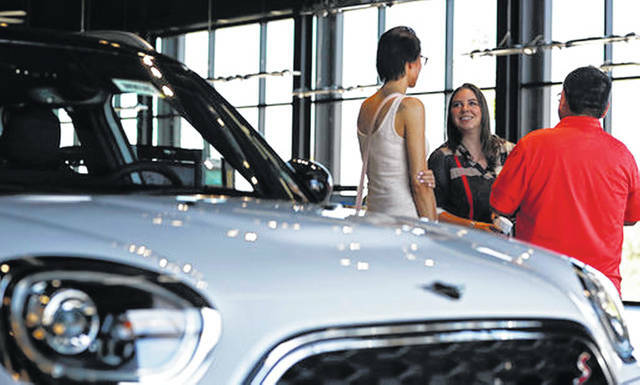 A salesperson, center, confers with two customers interested in the 2018 Countryman on display in the showroom of a Mini dealership in Highlands Ranch, Colo., in August. If you work with a good car salesperson, the shopping process can actually be fun, and you’ll be more confident you’re getting a good deal. If you work with a good car salesperson, the shopping process can actually be fun, and you’ll be more confident you’re getting a good deal. • Are highly recommended. Since receptionists at dealerships see everything that goes on, Jones says you can call and “ask who is the best, most knowledgeable car salesman.” Other ways to find the right fit are to check Yelp reviews or visit the “About Us” page on the dealership’s site. • Respond quickly. Calling before you go into the dealership gives you a chance to establish a rapport with your salesperson, Jones says. Or, you can text a question and see how quickly they reply — ideally, within the hour. Then, if you want to move forward, schedule a test drive and ask them to pull the car out and have it ready, says Weintraub. • Are expert listeners. Your car salesperson should understand your needs and wants — and meet them. It may sound obvious, but many salespeople try to sell you a more expensive car or whatever they happen to have on the lot. As a test, ask them a question and carefully listen to the response. If they directly answer your question, you’re on the right track. • Try to check your credit before a test drive. Some salespeople say they’re required to run a credit report before you test-drive a car. This isn’t true. And it should be cause to avoid this salesperson and, perhaps, the dealership. “Never let them run your credit until you’re ready to buy a specific car,” Weintraub advises. However, asking to see your driver’s license before a test drive is a legitimate request.